If your website isn't already mobile friendly, you're probably thinking of doing something about it. However, not all mobile websites are particularly search engine friendly, so in this blog post we will briefly present three options to help you make the right decisions on how to go about building your mobile website. First and foremost it's important to note that SEO for mobile websites is almost the same as for standard websites. The main difference is that local results are weighed higher on mobile searches. But even if you have complete control over the SEO of your website, you may still encounter problems depending on the mobile website model you choose. The easiest solution (but not necessarily the best) is to do nothing at all. If you already have a user friendly and search engine optimised website, it's possible to leave it at that. Smartphones do a really good job of displaying standard websites, but often the user will have to use the phone's zoom function to be able to read the text and hit the right links and buttons. This method isn't the most user friendly, but your website will be visible to mobile users. Try to visit your website via a smartphone and test the navigation. If you get annoyed by the lack of speed and usability, you should strongly consider one of the other options. From an SEO perspective, this is the best method to create a mobile friendly website. The main advantage of this model is that you only have one version of the website and one URL. This makes it easy to manage - there aren't two different versions of the site to be maintained and optimised - and you avoid taking a position on the SEO problems that can be a result of separate URLs. It also gives a good user experience because users always see the same site, although the elements may be arranged slightly different. On the downside, it often requires a redesign/adaptation of the design and code of the website. Both Google and Bing recommend this solution. The third option is to create a separate website for the mobile market on a separate URL. This way you avoid making changes to the design of your existing website. One of the drawbacks of this model is that you get two versions of the website that have to be administered and maintained. However, there may well be good reasons for choosing this model, for example, if mobile users are using the site for significantly different purposes than desktop users. This example shows how the HSBC/Bank of America mobile website considers how their mobile users are typically interested in online banking and local content and making that content easily available (note how they also link to the desktop version at the bottom). When choosing which way to go, it is important that you use your analytics data to assess your mobile users' behaviour and develop a mobile strategy that takes into account what content your mobile users are looking for. Try to map out the behaviour of those users who visit your website through mobile units and look at the involvement as well as what content they most often view. You will see a clear tendency in what the users look for when they visit your website through a mobile device. If the top 10 visited pages are 90% of the page views in connection with mobile access, then it would be a good starting point to optimise those 10 pages and make them functional to users who access the website through mobile devices. Doing this can make a seemingly impossible web project, the development of an entire mobile version of your website, reduced to the optimisation of few strategic pages. 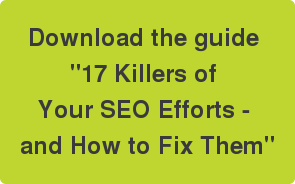 For an easy introduction to SEO, download the guide "17 Killers of Your SEO Efforts - and How to Fix Them".